Following the huge success of the 2012 and 2013 events, HomeGround and katebushnews.com are pleased to announce that there will be another Kate themed party this very special year. Not only can we celebrate Kate’s forthcoming live shows, but also the publication of the two-volume HomeGround Anthology. A very special year indeed! The party takes place on the night before the Summer Solstice, Friday 20th June 2014 and again will be at the legendary Royal Vauxhall Tavern. The RVT is in Vauxhall, South London, just over the Thames from the West End and is a two minute walk from Vauxhall Underground, main line and bus stations and is two tube stops from the Victoria railway terminus. The RVT is home to award-winning club night Duckie as well as the Hot August Fringe Festival and many other top music and cabaret events and performances. 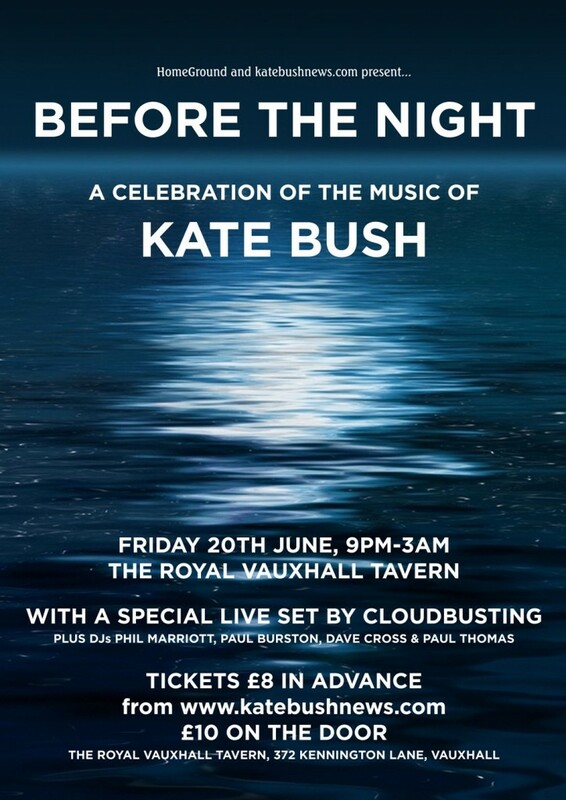 This will be another great night, in a special time a chance to hear Kate’s amazing music played loud in a club, and to meet loads of fellow KB fans! Just got tickets for the Dandies in London for 5th July, so what with that, finally making a Homeground/KBN party and Kate in September this is going to be a great year for crossing things off of my wish list. I would love to have made it down there, but it’s not going to happen for me. I just know it will be fantastic, because you put on such fantastic events. Keep it Kate and Keep it Loud, Homeground! Good to finally meet you face to face Peter and Krys after all these years – many thanks to you and others for a great night – CloudBusting were just amazing weren’t they! Sorry that you couldn’t make it Seán, maybe next time eh? It was a great party. Our thanks to everyone who came. Particular thanks to the DJs and their great tracks selections, and of course to Cloudbusting for a terrific and to Sky. Another “do” next year. Kate Bush rehearsals are going GREAT! Got a much needed day off today… A little sightseeing around London today with friends will be fun!